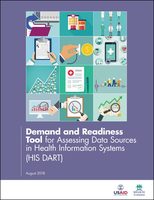 The purpose of the Demand and Readiness Tool for Assessing Data Sources in Health Information Systems (HIS DART) is to guide a systematic review of the demand for HIS data sources and the readiness of these sources to generate comparable data to monitor health system performance. Each of the HIS DART modules corresponds to one of the 12 data sources introduced in the companion reference guide: Health Information System Strengthening: Standards and Best Practices for Data Sources. MEASURE Evaluation invested in the development of both the reference guide and the HIS DART, because, despite a growing menu of resources available to assess aspects of HIS, there was not a tool that focused specifically on the data source component of the national HIS. HIS DART provides an objective appraisal of the alignment of each data source with relevant national and international standards. Conducting this kind of review across data sources is important, because countries need objective evidence as a basis for prioritizing HIS-strengthening investments. The HIS DART is a standards-based assessment in which the data sources are evaluated with respect to adopted standards. The questionnaires are designed to capture information that informs health authorities and other stakeholders about the alignment of data sources with these standards. The HIS DART consists of a set of 12 HIS data source modules, with each module containing a questionnaire accompanied by detailed instructions, question by question, to help the administrator and respondents to elicit, convey, and record valid information. These modules are presented in this publication. The questionnaires for each module are available as editable Excel files and printable pdf files below.